Oribe is a luxury hair care brand and their products match that with premium prices that won't be to everyone's budget. The Cote d'Azur Luminous Hair & Body Oil is a perfect example, coming in at £65 for 100ml, a luxurious splurge buy, but boy is it worth if you can afford it. It's presented in the most beautiful gold and black bottle, almost gothic in design and has the look of an expensive perfume bottle. Unlike some oils which can have a messy pump or pour applicators, it comes with a spritz that can be applied either directly to your hair or body or into your hands to be applied to your hair or massaged into the skin. 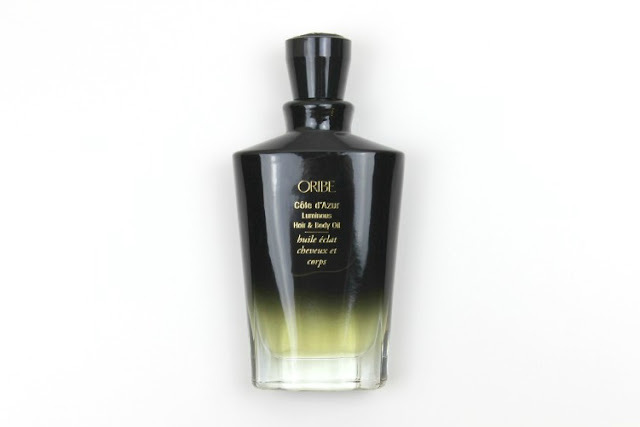 The signature Oribe scent gives makes the oil smell incredible, teaming Calabrian Bergamot, White Butterfly Jasmine and Sandalwood which when used on your hair - which is how I prefer to use this hair -, leaves your hair smelling gorgeous from morning to night. The formula features a restorative blend of Sweet Almond, Meadowfoam and Starflower nourishing oils and it's completely free of Parabens, Sulfates or Sodium Chloride. I have a particularly sensitive scalp, one of those few awkward areas I have eczema, and I find this more than gentle enough to use on my hair without causing any irritation. I find it incredibly easy to use whether spritzing directly onto my hair or into my hands to run through my mid-lengths to ends. A couple of spritzes is more than enough and it doesn't leave a residue, which is great for styling after application and also works well with my naturally oily hair. It leaves my hair looking healthier, with a natural looking shine and a beautiful soft finish that leaves my hair feeling as if it's been cut much more recently than it has. A splurge oil, but one that will last you an incredibly long time. You can check out the full Oribe range at www.spacenk.com. sounds amazing! Our hair deserves a little tlc and even though the price tag seems a little high, if it works thats the price you gotta pay!